These pillows are beautiful and they look great on our rustic bed in our mountain Cabin! Evoke the aura of a cozy mountain lodge when you place this decorative throw pillow on your sofa or bed. 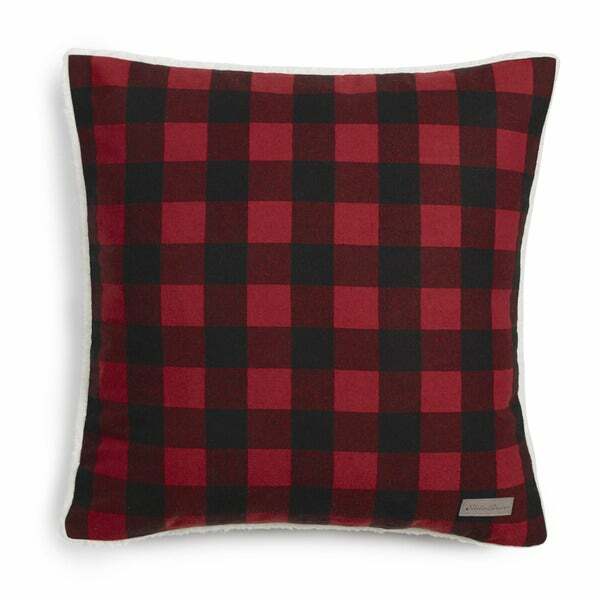 With its plaid flannel fabric, this red and black pillow offers an ideal accent for the winter months. I love the throw and pillow! The colors are vibrant and the throw is very soft. Great for my cabin! You won't be disappointed with this combo purchase. The pillow comes as a pillow not as a pillow cover, which makes it a great deal. I ordered two of these for a window seat, and I love them! They are well made, and the fabric is very soft. One side is a red and black buffalo check pattern, while the other side is a creamy white Sherpa. They look just like the picture. Awesome decorative pillow for the money. It is made of quality material and very comfortable. 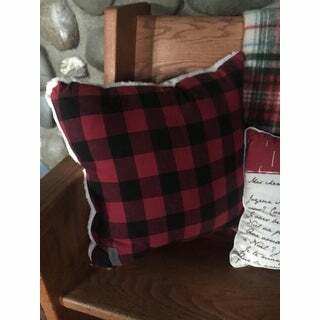 Pillow is very soft and cozy and goes well with the plaid sherpa i bought! 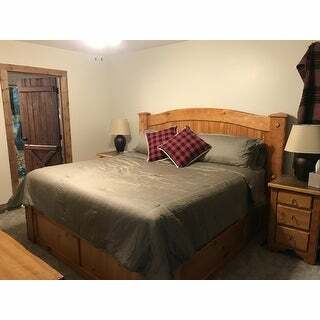 I love the look of the plaid pillows and they look great in my rustic cabin. Only gave 4 stars due to the fact the fill pillow is very low quality and the back of the pillow cover is a cream fuzzy fabric which looks good but every sticks to it so it looks dirty. I have washed the cover serval times it does not come off. You have to pick it out with. In most cases this would not be a big deal but since I am using a cabin we tend to have most of the outdoors come inside with us. :) Its odd because the matching blanket does not have the same issues. This is a nice accent pillow. I'd recommend it. I was not expecting this pillow to feel so lush and full. It is thick and very expensive looking. It will go perfectly with my other buffalo plaid Christmas decor. Can't wait to display! Living in a log cabin is quite cozy, but can be drab. I bought two of these and that pop of red is a perfect contrast to the darker wood. Well made, very squishy and cozy. Such a great product. So soft and a great deal. A nice full pillow, soft and comfortable. Exactly what I was looking for. Beautiful pillow. Very thick and soft. Looks great in my lodge style home.Will use only as decor because of the white backing on it. This is a great pillow. My husband loves it. I would have preferred both sides with plaid but I still like it. The Sherpa is super soft! I ordered several of the matching throws and we love them too! They are Beautiful!!! I bought them for Our RV because I'm a Buffalo Print kinda Girl. Anything Eddie Bauer is Quality!!! Love them! Fast service, soft pillow, look great! In the picture with the comforter I purchased!